I’m veering off topic a little today and looking into a building connected with the Manchester and Salford Boys’ and Girls’ Refuges and Homes, but not one under its jurisdiction. 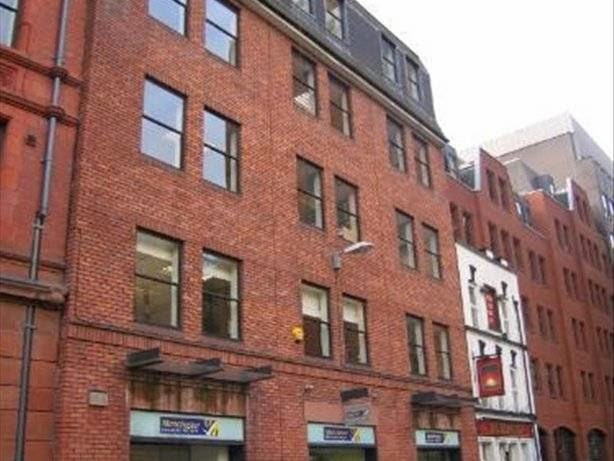 In fact it’s a very important little building that lies just off the main road off Deansgate on Queen’s Street. It catered for ragged children in the area in the nineteenth century, providing free education and often their main meal for the day. Ragged schools were charitable schools opened to provide free education to destitute children. The first few were opened in the late eighteenth century and by 1844 the number of schools appearing, led to the formation of the Ragged School Union. In Manchester well known ragged schools include Charter Street and Sharp Street located in the slum area then known as Angel Meadow. But other smaller schools were also in existence. At 24 Queen’s Street, from around 1853, resided St Ann’s Ragged School. Connected with the nearby St. Ann’s Church, which catered for many of the business men in the area, it was run by local men determined to give something back within their community. So why was this small building so important to the history of the Together Trust? Well it was here that the charity’s founders, Leonard K. Shaw and Richard B. Taylor met and it was also here that the two men found their calling to help the destitute children of the city. Similar to the well-known tales of Jim Jarvis told by Thomas Barnardo, the start of the Manchester Refuges likewise began due to a single heart rendering event. 'One evening during the winter months of 1869, Shaw and Taylor on leaving the school at the end of the day, almost tripped over a bundle of rags on the schools doorstep. This bundle of rags turned out to be two small boys. On questioning why the lads weren’t at home they received the answer ‘we ain’t got no home’. So the two men each took one of the boys to their own home and provided them with a warm bath, food and a bed for the night'. Do you know anything about this school? We would love to know more about its origins. My ancestor, John Lever (1746-1798) lived on Queen street. I believe he was in business with John Leigh Philips who also lived in Queen Street. All John Lever's children were christened in St Ann's church. Do you know if he or his wife, Mary Houghton were involved with St Ann's school? I believe the ragged school opened in the 1850s which was after the time you are referring to. However if you would like to email me at liz.sykes@togethertrust.org.uk I may be able to provide you with some more information to help you in your research. Like to know more about a certain home or period in the Together Trust's history? Why not comment and let us know. Content of this blog © Together Trust. Registered charity number 209782. Theme images by Airyelf. Powered by Blogger.